Communicating by text is the norm nowadays, especially when it comes to dating. It’s a lot easier to send out at text to someone you’re interested in rather than putting yourself on the line by *gasp* actually calling. There’s a lot less to be nervous about when you’re not actually making a phone call and you can spend some time thinking about what to write. However, the casual nature of texting can also lead to some fatal mistakes. If you text a guy too much too soon, you can come off as desperate and kill the relationship before it even gets started. Should I text him first or wait for him to text me? How long should I wait before I text him back? He never replied to my text, should I text him again? If you are waiting around to hear from a guy, you can come up with all sorts of crazy scenarios to justify firing off a text. Maybe his phone died? Maybe my text never actually sent? Maybe he lost my number? Maybe he thinks I’m not interested because I didn’t text him first? Against your better judgment, you bite the bullet and send him a text. I mean, how bad could it be? It’s not like you’re calling him ten times and leaving tons of messages. But then, he never texts you back. Or even worse, he replies with a short answer and doesn’t show much interest, leaving you scratching your head and wondering if you should keep texting. Now you realize you never should have texted him in the first place. What if you had a handy dandy flow chart to tell you what to do in every conceivable texting situation? Well you are in luck! Simply answer the yes or no questions until you get your answer. This will save you from committing any texting fouls in the future. 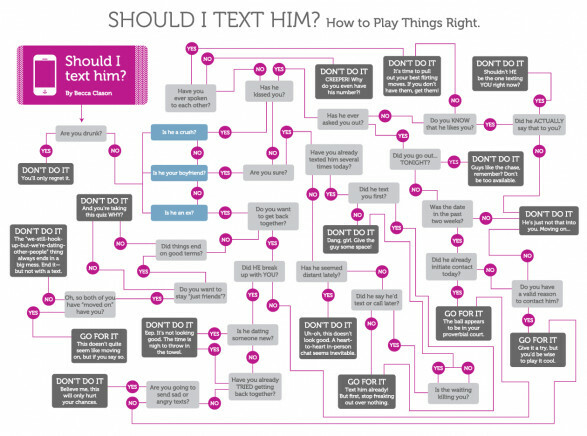 I have never laughed so hard looking at my phone ad I read the flow chart! Awesome ! I actually understand things better now.